As our story opens, we find someone committing crimes in the guise of Spider-Man! Obviously, we readers know it can't be him - but if not, then who? We might have wondered if it was the Chameleon, come back in disguise to get both rich and revenge - if, that is, the cover itself hadn't proclaimed the appearance of a new baddie inside. But though delaying the fact of a new villain's debut might have made for a more suspenseful story once purchased and in the readers' hands, allowing us time for countless conjectures, we also can't deny that Mysterio's design is incredibly eye-catching, and might certainly have sold more covers than not. A more suspenseful story is thus squarely at odds with the sales appeal of an eye-catching cover - and, as it turns out, it's not the only opposed elements to be found herein. We all knew it was coming: Pete's finally cracking up. And so, faced with eyewitness proof of this evil Spidey's crimes, Peter starts to wonder if he's losing his mind. Neat! Yes, others have dressed up in a Spider-Man suit before, but this one can climb buildings and shoot webs! So Peter decides to do the scientific thing and submit himself to diagnosis. But he does this by going in for a mental checkup from a psychiatrist - and in full costume, to boot! As the cover states, this is a development that no comics reader would ever have expected to see. 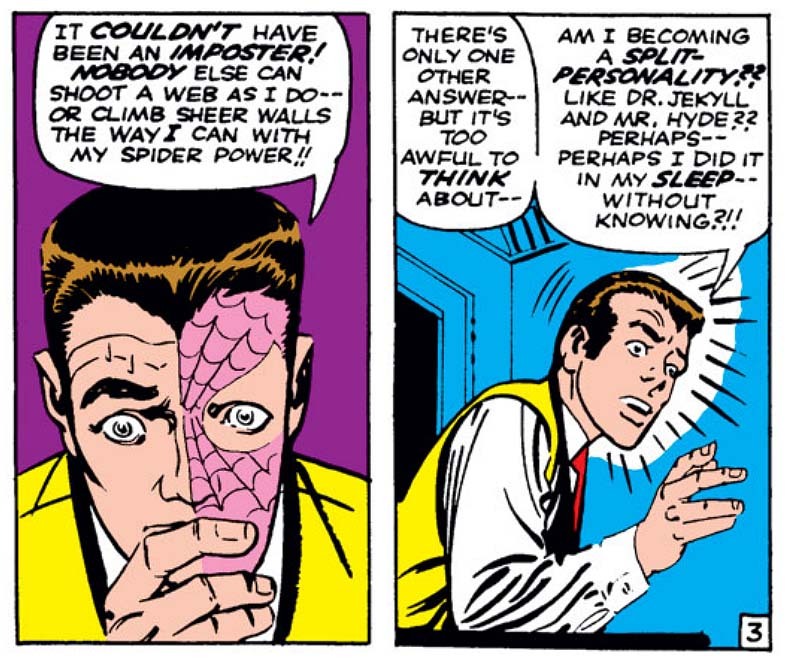 But alas - we in fact don't, as Spidey has only begun to speak before realizing that in the course of such an exam he might accidentally divulge his secret identity. And so he ducks back out the doctor's window, only minutes after he'd popped in. What a tease! with a full range of thoughts and reactions. It feels like a real New York street! In the wake of Spider-Man's terrible turn, the enigmatic Mysterio appears, offering his services to catch Spider-Man and make him pay. 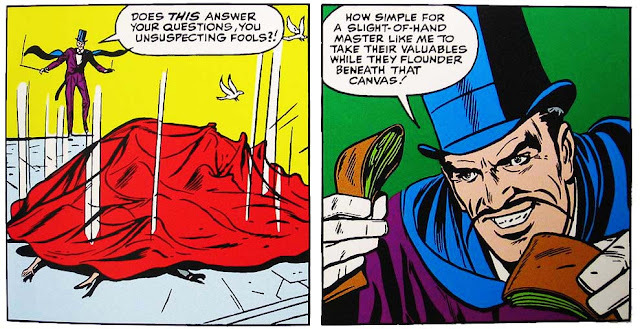 And for a Marvel villain, it's not a bad plan: to first collect the loot from the robberies, then rake in acclaim for catching the alleged perp! Interestingly, readers of Steve Ditko's other ongoing feature might have rightly seen Mysterio, complete with swirling smoke and seemingly magical powers, as belonging to the same sorcerous archetype as Doctor Strange. 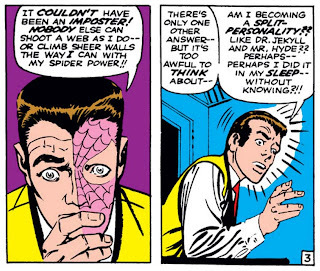 Which is why it's so frustrating to see this possibility immediately undercut by Lee's script, which finds Spidey coming up with instant scientific explanations for everything Mysterio does. ("How does he keep his balance that way without falling? I'll bet his shoes are magnetized!" "The web is dissolving - vaporizing!! As though sprayed with a fine chemical mist, too small for the eye to see!") 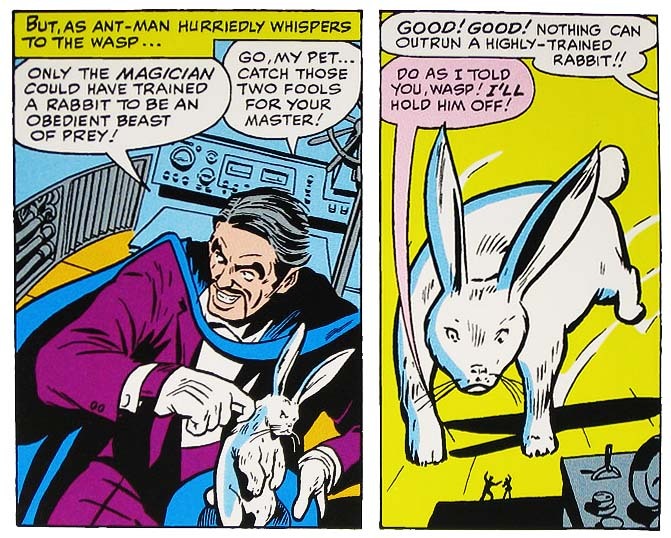 Mightn't the story have been more suspenseful were we allowed to think of the villain as a powerful wielder of magic and mysticism, and completely out of Spider-Man's league - at least until the later revelation? 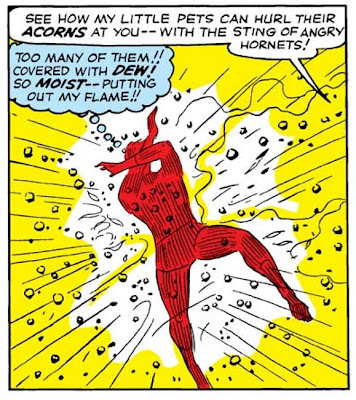 It's another case of "two steps forward, one step back", and it makes one wonder if the writing so at odds with the art is a sign of the eventual rift between Lee and Ditko showing its first conflict here. "Two way mirror idea" "Cannot see in - can see out"
Finally, a cute side note about this issue: As intended and as first received, this is the first appearance of Mysterio, yes? But it wouldn't stay that way forever! 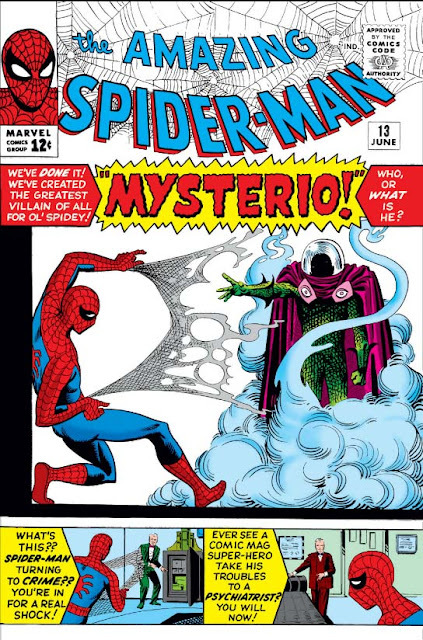 For 1981's Peter Parker, the Spectacular Spider-Man #51 would reveal that Mysterio had been one of the "aliens" seen working for the Tinkerer in ASM #2, himself subject to an earlier retcon in ASM #160 from 1976, which established that the villain and the alien invaders were in fact just a bunch of crooks in disguise. The later revelations may not sit entirely well with the initial Tinkerer story as originally presented - but then again, given such ludicrous elements as the disguised alien's supposedly lifelike mask, the original story wasn't entirely flawless, either! Like last issue's fight in the art studio, this time the action crashes into a movie set. It may again be needless, but it's enjoyable and appreciated! 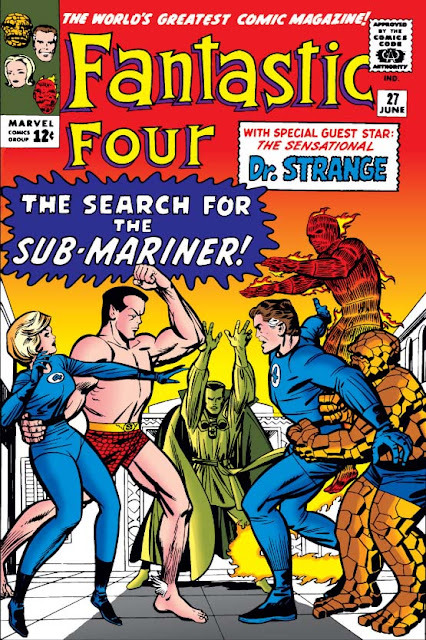 Guest-starring Doctor Strange - and the fury of the Sub-Mariner! When Sue Storm is kidnapped by Namor, the Torch decides to call on the master of the black arts for aid. Though Johnny has only heard vague rumors of the man, he gambles on their truth and leaves a message asking for help. 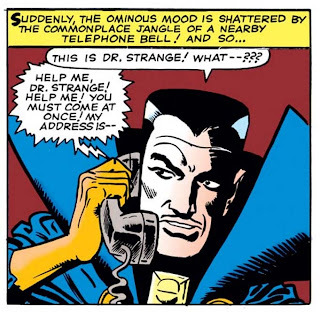 And so we get not only the first story mixing Doctor Strange with the rest of the Marvel Universe, but also the first instance of Strange drawn by someone besides Ditko (not counting covers) - specifically, Marvel's other giant of this era, Jack Kirby! 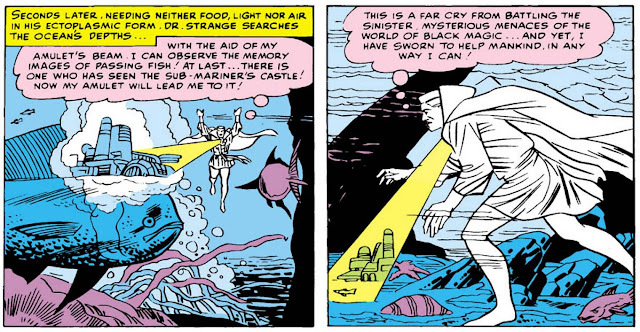 An interesting note is that although Strange helps the FF locate Sue and successfully spies on the Sub-Mariner, Strange and Namor don't actually meet. It's rather appropriate, since in eight years' time they both would form one half of the greatest "non-team" in comics! portrayed in Strange Tales. 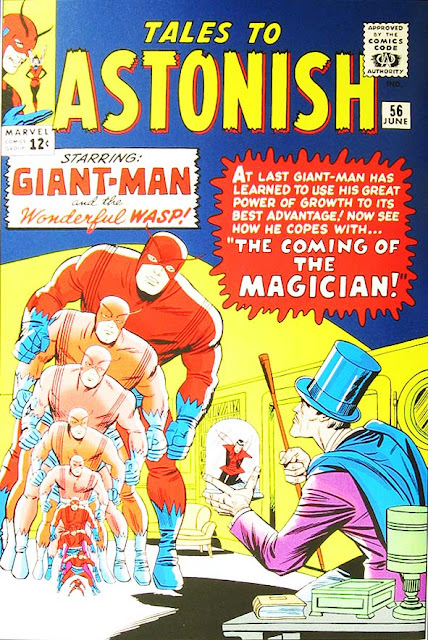 Perhaps it lacks the claustrophobic intimacy of Ditko's pen? This issue finally brings to a boil the love triangle between Reed, Sue and Subby that's been simmering since Namor's initial return in Fantastic Four #4. 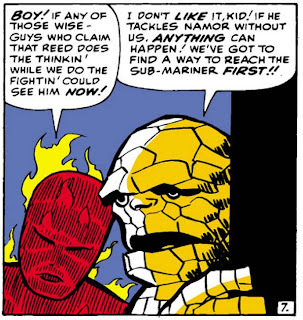 Early on, Reed declares to Ben & Johnny his intent to marry Sue; and yet, in typically ironic timing, this is exactly when the Sub-Mariner decides that he can't live any longer without her. Hence the abduction (a tried and true component of every love story, yes?). The effect this has upon Reed clashes marvellously with our usual conception of Mr. Fantastic as a stuffed shirt, interested in his lab and little else. His passions and his fury roar into life, and both Johnny and Ben are taken aback with their force. If this is Stan Lee addressing any reader complaints about the team's "dull" leader, it's certainly an effective reply! You get the sense of two scared kids watching their father seriously freak out! The only complaint with the romance subplot, really, is that readers might feel they've read it somewhere before. In fact, readers in 1964 would have seen it just last week! 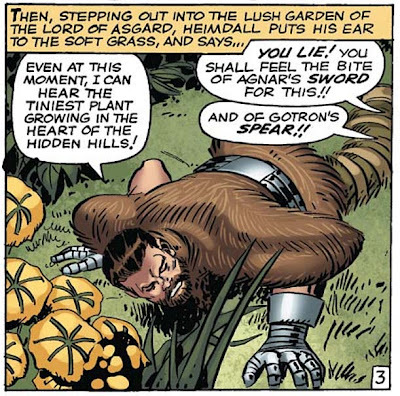 For isn't it remarkably similar to the most recent Giant-Man story, and the burgeoning romance of Hank and Jan? Think about it: At the start of the tale, Reed openly declares his love for Sue. Check. 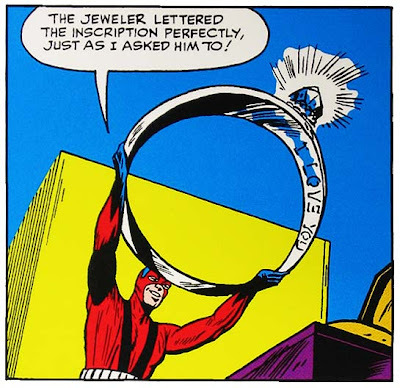 He's even bought a ring! Check. But before he can pop the question, chaos ensues, and at the end of the tale there's some measure of doubt in Reed & Sue's hearts about the true depths of the other's feelings - and the question goes unasked. Finally, finally: Check. Look, recycling stories is fine, and was done quite often in these early years of comics. But repeating one's stories in the very same month?! That's a new record, even for Stan! But at least the postponement of this resolution will be much, much shorter than that facing Hank and Jan - in fact, it will be only a year. "Hey, Doc, we got a problem. Think you can help us out? ""Sure thing, man. I'll just jump in the ocean and read the mind of a fish!" On a lighter note, the story begins with Reed working in his lab, perfecting a new invention: The thought projector! As a device which allows a person to project their thoughts for all to see, it seems remarkably similar to certain powers we've seen Professor Xavier display during the first few issues of The X-Men. 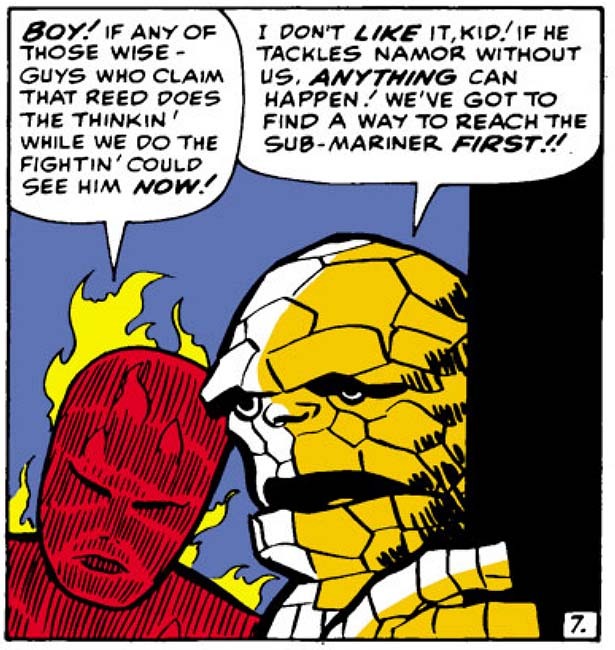 Could we perhaps conjecture that this might have something to do with the Torch's recent run-in with Iceman, and that a later report on the same might have got Reed to thinking about their leader, the mysterious Professor X? It could be, it could be ... and after all, the X-Men are set to guest-star in the very next ish! 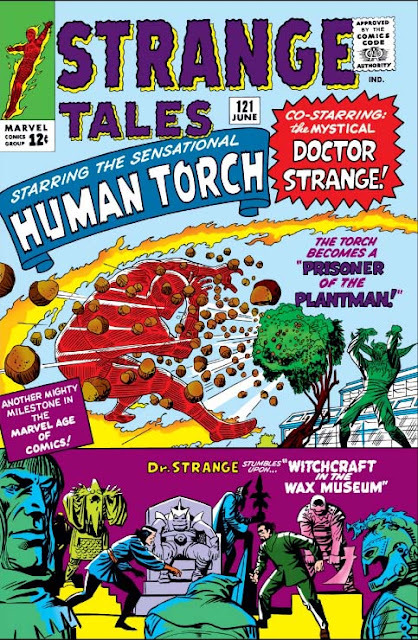 The first page describes the Plantman's return as "One of the most fearsome foes the Torch has ever faced! ", and ... really, could even the most wide-eyed kid in 1964 have seriously believed that? This is a character who was hokey in his inception, and has remained hokey ever since, and his continued appearance through the bulk of Marvel's history is as unlikely as it is ridiculous. Granted, his debut did imply a certain mental instability (even beyond that required for the typical super-villain), and that alone could largely account for his actions here. Any reasonably-minded person would have considered himself fortunate to have escaped the first time, and left his evil plans behind! Or at the very least find himself a new enemy to obsess over, because the outcome should be obvious: Fire and heat trump vegetation, every time. 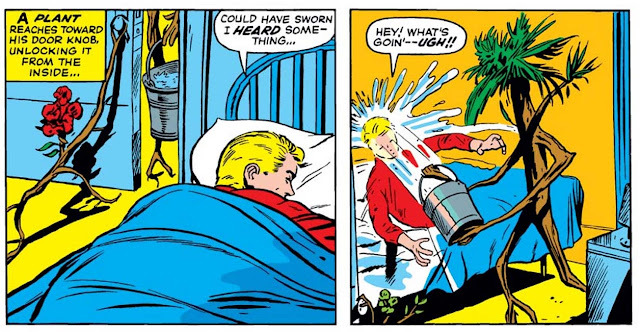 Johnny Storm: All washed up. But rather than leave the Torch to other, more evenly-matched bad guys, the Plantman targets him for revenge, tracking Johnny down at his Glenville home. Although the scene is played mostly for laughs (he uses his plants to throw a bucket of water on Johnny, then taunts Storm's inability to stop the Plantman's next crime), the most compelling element is the early insight, if only implied, of the dangers to be found in deliberately eschewing a secret ID. 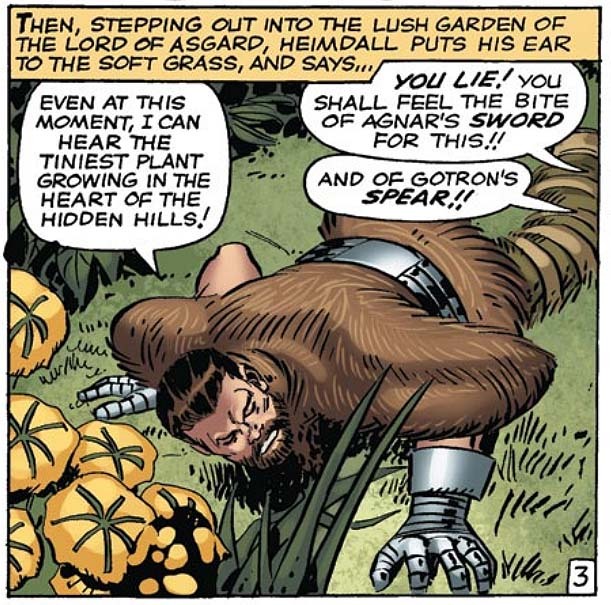 The stories which riff on that today are a much darker shade, with a hero's loved ones terrorized or worse - yet even here, with the goofy Plantman's goofy plants, the seed of such fears are still present on the page. it might be time to call it a day. The backup story sees a return as well, as we once again face the menace of Baron Mordo! But while he'd quickly worn out his welcome by being used far too often at the start, his absence these past few months has made all the difference, and his reappearance is well received. And there are further signs of Ditko and Lee figuring out the strip when Mordo prevents Dr. 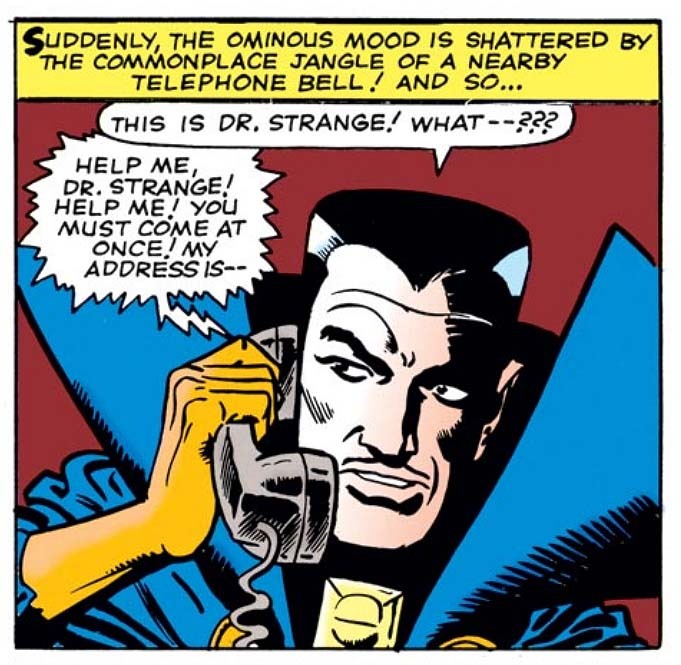 Strange's astral image returning to his body - for we're told that if Strange cannot reunite with his physical form inside of 24 hours, he'll surely perish! The significance here is that for the first time we're finally starting to get some rules in place for the Doctor's magical travels and sorcerous powers, rather than have him solve every little crisis du jour with the latest bit of arcana ex machina. It makes Strange no longer as all-powerful as he'd seemed, and goes a way towards restoring a relatability and sense of danger, both of which had been of late fading fast. And yet in contrast to the great strides being made in some areas, there are still certain odds and ends which, while not too distracting, do seem a bit off. For it can't escape our notice that despite the Wax Museum being both story-titled and cover-featured ... it actually has very little to do with the plot. Did Stan, upon receiving the pages, latch onto that element as the tale's most distinctive and salable feature, regardless of its relative unimportance? Or, conversely, did the drawn story perhaps deviate markedly from the pitch - with Stan ballparking to Steve, "Hey! How 'bout a yarn where Doc Strange fights Baron Mordo in a Wax Museum?! ", and then Ditko fulfilling the letter of the request, if not entirely the spirit? In this context, "magic" seems to mean "we can make up whatever science we like." It's sad to say, but this is Kirby's last issue as regular penciller for the title. Against all odds, he & Stan have created a war comic that's a successful blend of action, humor and pathos - but now, it seems, it's time for him to move on. And so we ask: What prompted this? Was it dissatisfaction with the work? Did it not appeal to him as much as the bombastic and over-the-top cosmic stories starring characters like the Fantastic Four and Thor? Were his talents just being spread too thin? As it happens, the true answer may be that he was simply a victim of his & Stan's own success on the title - as, beginning with the very next issue, the comic will finally go monthly! And while Jack was a veritable speed demon on art, an additional monthly comic might have been more than even he could handle, in a way which a bimonthly one was not. Oddly enough, this farewell story for Jack is one that doesn't play to his typical strengths of wall-to-wall action, but is at its heart a quieter, more cerebral story. One night, while Fury and his Howlers are on a mission with the French underground to destroy a strategic ammo dump, all hell breaks loose. Nick suddenly has an unexplained change of heart, yells that they have to stop, and strikes his accompanying superior officer to make his point. 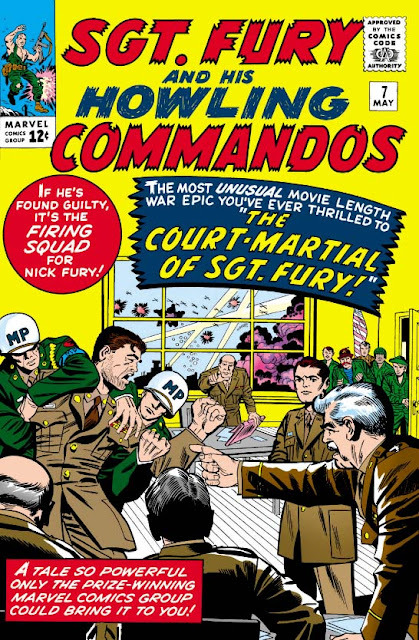 This, as the cover indicates, is all that's needed to get Fury court-martialed - but since a bomb struck the company amidst the chaos, leaving him concussed and with a case of amnesia, he can't remember why, and thus has no defense! the dialogue and you'd still have a scene that's distinctive and clear. In an interesting move, this story thus becomes more a courtroom drama than the "stealth missions and gunfire" war comic we've come to expect. The departure is a welcome one, however, and is done with both distinction and subtlety. For instance, the prosecuting officer actually seems a decent guy, and although he believes Fury is guilty, he genuinely forgives Nick's emotional outbursts. Quite different from the underhanded prosecutors we often see cast in this role! The highlight of the issue, though, comes from the character witnesses called upon, who give us our very first glimpse of Nick's youth as a troubled young orphan in (we can surmise) the 1920s. To no one's surprise, Fury was a scrapper even in his teens. In fact, the only downside to the story comes in the resolution. 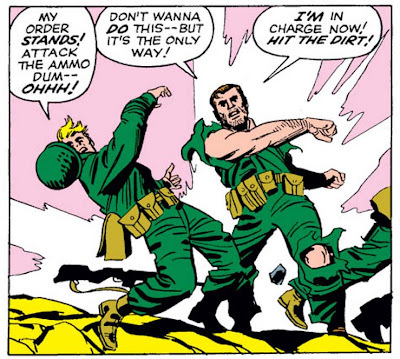 As mentioned, Fury's case is made nearly impossible by the fact of his amnesia - a plot device eye-rollingly convenient even in the best of times. But, as the clock ticks closer to his conviction, and German air forces converge on the site of the court martial, we wonder: What did Nick know? How will it come out? Had the ammo stock the Howlers were to target been sabotaged by Allied forces, designed to destroy the Nazi fighters at the time of use? Will the natural progress of events show Nick to be vindicated, in the proverbial nick of time? Sadly, the answer is no. Instead, the court is caught in the blast of some German bombers, and Nick's poor head - jarred for a second time - dislodges the amnesia, providing him once more with the answer he needs. Y'know, once was convenient enough. Twice in the same story though? That's the kind of cheap ploy usually seen only in cartoons - and it has the unfortunate effect of reducing this otherwise compelling story to the level of one. This unusually serious tale still manages the rare moment of comedy. So: Thor and Odin have been getting under each other's skins. Thor can't understand why Dad won't let him live his own life, while Odin is all "While you're under MY roof...!" about it. Who among us has never been there? A truly masterful schemer might have left this building friction to its own, and reaped the benefits of that failing relationship in the fullness of time. But Loki doesn't yet have that much subtlety to his machinations, and decides Odin's trip to Earth is his best opportunity to remove the All-Father permanently. 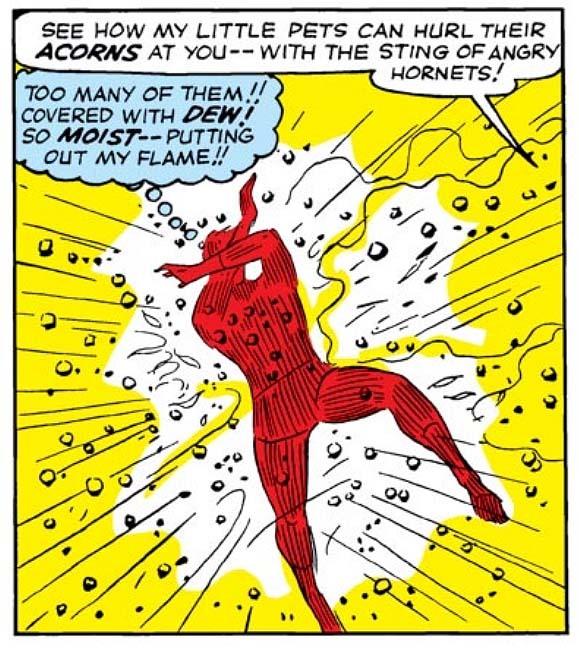 To that end, he unleashes Odin's most fearsome enemies: Surtur the Fire Demon, whose ancient defeat we saw in Journey into Mystery #99, and Skagg the Storm Giant - although, based on the "ring of fire" Skagg is released from, Stan might have been thinking of Ymir instead. 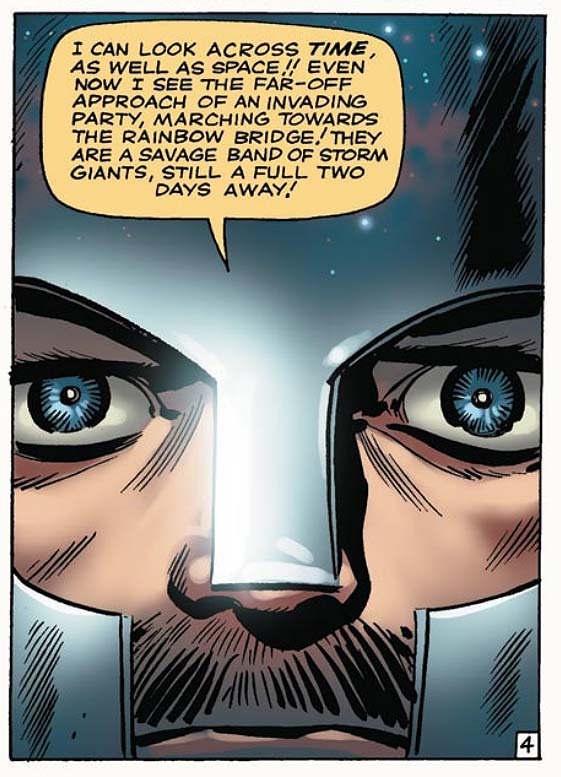 Details aside, this illustrates - for any readers who might have wondered - that the "Tales of Asgard" backup strips don't take place in a vacuum, and can in fact feed back into the main, present-day story. Stan and Jack are weaving a tighter, more cohesive whole out of the separate areas of Thor's life, and it makes for a stronger body of work in full. Was that really the simplest way to address the situation? If so: WOW. Fortunately, all is not lost, as watchful Heimdall hears of Loki's plans, and summons Balder the Brave to assist Thor and Odin on the earthly plane. And what a battle it is! Thor, Odin, and Heimdall on one side, with the titanic forces of Skagg and Surtur on the other - and the Earth caught between! But y'know, despite Odin's decrees that his son stop dating the Earth ladies, he really does have a soft spot for our race ... and so, in an effort to spare us the trauma and destruction that will surely ensure, he stops time and removes the entire human race to another dimension! 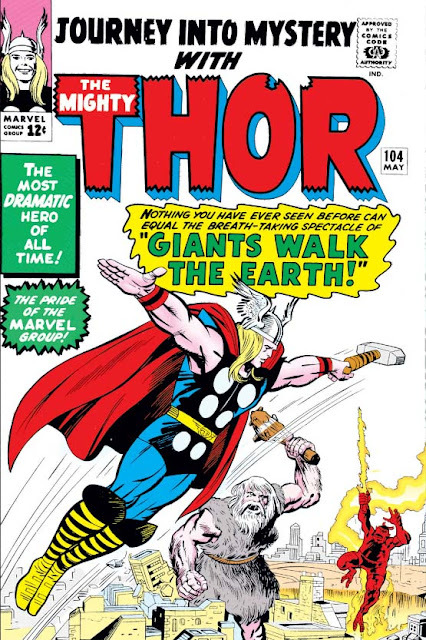 The level of power this bespeaks is staggering, and the fact that it's done as an offhand gesture really makes us reassess our thoughts of this Asgardian god-king. Perhaps Heimdall isn't taking the audition entirely seriously. The starfield effect isn't present in the original artwork. I don't care. I think this looks great!